Regular readers know that helping animals is important to me and pretty much the mission of this blog. I have always loved animals and have been rescuing dogs, cats, mice, snakes, birds, etc., ever since I can remember. Growing up I spent several summers on farms and befriended pigs, goats, chickens and cows – including a cow I named Miss Lillian who remains one of my favorite animal friends of all time. 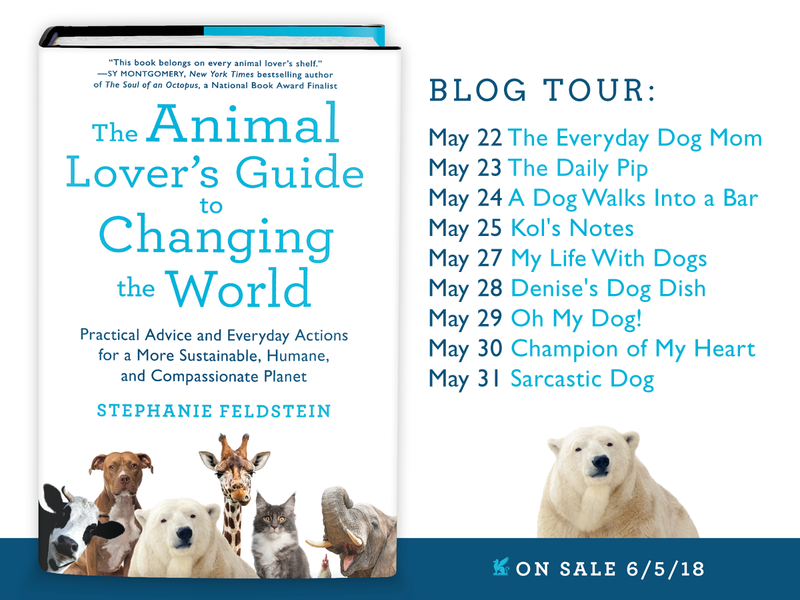 So, when Stephanie Feldstein asked if I would like to review her new book The Animal Lover’s Guide To Changing The World, Practical Advice and Everyday Actions for a More Sustainable, Humane, and Compassionate Planet, it was kind of a no brainer for me – and I immediately said yes! The Animal Lover’s Guide To Changing The World will surely become the go-to guide for making compassionate choices and helping animals – domestic, farm, and wild. The book is based on the belief that ‘all species deserve compassion’ and connects social justice and animal welfare by illustrating the interconnectedness of all living things. This book is dense and at times overwhelming (because these are serious issues and many animals are in crisis because of human action and inaction). Although I read it straight through, I might suggest newbies begin with the sections that most interest them and use the book as a starting point. Maybe you want to start by replacing toxic cleaning products that poison the water and harm wildlife and then next month focus on reducing your meat consumption. Keep in mind that small steps matter and not every choice is right for everyone. Prior to reading this book I felt pretty good about my life choices. I have been a vegetarian (almost vegan) for 30 years and I am very careful about the personal care and household products I use, choosing cruelty-free whenever possible. If an animal crosses my path that needs help, I try to help. I am active in local shelters and all of my past and present pets have been rescues that were out of options for one reason or another. After reading this book, I realized that I could definitely do more to help local wildlife. Up to this point, my efforts and donations in support of wildlife have been for polar bears, whales, manatee, and tigers. But newsflash, none of these animals actually live in the midwest. Going forward, I want to focus on efforts that benefit local wildlife and my family has just joined a volunteer wildlife monitoring program (see turtle photo below). I also plan on making my yard more welcoming to birds, butterflies, and bees and get more involved in community gardening and local habitat restoration. Bottom line: there’s always more than we can do and The Animal Lover’s Guide to Changing the World is full of ways to make an impact for animals everywhere. This lovely passage from the final chapter of The Animal’s Lovers Guide to Changing the World pretty much sums up everything for me. I want to be more like an elephant. How about you? Please leave a comment about the ways you help animals between today and May 28 for a chance to win an advanced copy of the book. Stay tuned for some exciting news about my blog in the coming weeks! We don't get the opportunity to help real wildlife much but the Dad has rescued many a turtle. We can't wait to see what's up with your wonderful blog. "There is always something more we can do" how true – we need to understand that even taking the smallest steps will add up. This is a book I would love to read! I love your take away after reading the book. I have been focused on cats, as you know, but my husband and I love animals of all kinds. I've been a vegetarian for several years and my husband became one a couple years after I did. We should also look into more local efforts for how to help wildlife. Great review! And I can't wait to see what you're going to be doing with your blog next. Sounds like a wonderful book, and I think the pawfect gift for a special animal lover I know. Thank you for the recommendation. This sounds like an AMAZIN' book with a VERY IMPORTANT message. While no one peep can do everythin', EVERY peep can do somethin'. EVERY PEEP CAN DO SOMETHIN' TO HELP. Every single one. And how great is it that this book has led you to helpin' local wildlife. I think that's fantastic! I really, really do. PURRS. It sounds like a really comprehensive book and one that I'd like to read. I'm excited to find out your news about your blog! As an animal lover and former environmental science teacher, this book sounds incredible! It can even apply to our pets in so many ways! Lots of people don't bother to pick up their dog's poop on walks in nature – but they may not realize that the smell and bacteria could impact other wildlife species in the area. If it changes wild animal behavior, that might mean that the critters need to expend extra energy avoiding the area where our dogs have been – which may result in less energy for normal survival activities (eating, mating, staying safe…). The book looks fantastic and I love anything that gets people thinking about how they can live more sustainably! Thank you for sharing! Elephants are definitely smarter and more thoughtful than humans. This sounds like such a wonderful book, and I will be purchasing it. I have cut down tremendously on toxic cleaners and now I get less headaches when I clean. For several years about 98% of my makeup has only been cruelty free, and lately I've been successful in finding skin and hair care products that are cruelty free. One little change can help a lot. Mom's job is to keep us from interfering with local wildlife. Each person has to find the path and level of involvement that works for them and is sustainable for them. The key is be positive about the good you can sustain and where possible do, but not feel badly when it just isn't something on your life path. We have seen so many heartfelt videos on facebook about elephants. Yes, we should all be more like the caring elephants! I like the idea of this book but have a hard time reading about animal abuse – elephants are so abused in many countries and tourist should avoid riding them. I'm wondering if tourism is a section in this book. There's a lot of harm done there and people seem to lose all sense of reason when 'on vacation. 'Meat consumption? Dropped that 27 years ago. That sounds like a really good book. Helping animals is something that I am passionate about as well. I know I could do more, though. Thank you for reviewing this book and inspiring me to step up my game. Books like this needs to be study material in every school in the world. we have no idea what we are doing to our planet. OK some do most don't care and that needs to be remedied.Teachers drowning wild animals in lessons, here in NZ you the farming locals drown possums for entertainment. THEY are the ones who needs to be remedied. Sounds like a great book. I can't believe the number of animals who've become extinct in my lifetime and the others who are on the endangered list. It's so sad! This is wonderful. I believe that some people can feel overwhelmed with the rescue world, and my advice is just to start with one thing, and then when they can move to two things do that. We can all make a difference. If you can start a food drive, do that. Then if you can raise some funds, do that. You will help more than you realize. I work as an environmental consultant and the company I work for does a lot to help native species. Unfortunately, we also do a lot to get rid of (kill) invasive species. One of my jobs is oiling goose eggs to keep the goose population down since they are very invasive and contaminate the water. But we also do good things like planting native plants and improving water quality. Small things, like planting native plants in your yard can make a big difference for local wildlife. One small step. I've been doing cruelty-free HBA products. And I try to reduce waste. Some of the packaging out there is just crazy! I use a biodegradable cat litter for my crowd instead of clay. I never really thought about their carbon footprint until recently but using environmentally friendly products for the cats, and feeding humanely raised meat can all be that one next step. That sounds like just the book Mom needs. Like you, she has been a lover of all animals of all kinds all her life (she even likes bugs, spiders and snakes.) She wishes she had grown up on a farm or had one of her very own today. Mom has planted various flowering shrubs, vines, and perennials specifically to attract butterflies, birds and bees into our garden. She also welcomes our resident squirrels, garter snakes, frogs and lizards. And she doesn't tell the neighbors when the occasional vole shows up in the lawn, 'cause she doesn't want them to try to rid of them with poisons. We have so much to learn from animals. I'll definitely find this book! Animal rescue can be so demoralizing – but also uplifting. The biggest thing I did was become a vegetarian in 1988. While I don't harp on others to do the same, I feel joy in my decision to live this lifestyle. Super review. I am a meat eater but always try to avoid factory farmed meat, and eat much less meat overall than I used to. Except – I could do better. Next step – avoid meat pies and sausages where the provenance of the meat is uncertain. Cheers, Gail. This sounds like a super book! Thank you for the review/recommendation; we'll be sure to check it out. Looking forward to seeing what's up with your blog! i donate on a regular basis to the local pet food bank. about 2 yrs ago i won over 500 lbs of pet food for the shelter. i also get things off the freecycle to donate, like towels, cat and dog toys, unopened food, cat trees, etc. i contact my local reps when i feel that something needs to be done about how animals are treated. sometimes i will put food out for the wild animals, but i put it in the woods so they wont come near my house. i help out with rescues and shelters when i can. I absolutely loved this book. There were so many action alerts listed that are super practical – like start a book club. I have so many summer to do's now! That sounds like an amazing book. Thanks for sharing the wonderful post about this book. We are going to have to pick one up now. Looks like a very interesting read. Love the photos that you share. Hope you are having a terrific day.